Like thousands of others across the country, students from Syracuse University and the State University of New York College of Environmental Science and Forestry participated in the March Fo[u]rth on Climate campaign Monday morning. The campaign advocates for climate justice across the country on March 4. Protestors at Hendricks rallied in an effort to get the two institutions to divest, or cease investing, in fossil fuel companies. The SU and ESF Fossil Fuel Divestment Campaign sponsored the event. The students’ chants continued as they marched to Crouse-Hinds Hall, where selected representatives from the Fossil Fuel Divestment Campaign met with members of SU’s Sustainability Action Council, Vice Chancellor and Provost Eric Spina, Chief Financial Officer Lou Marcoccia and Laura Steinberg, dean of the L.C. Smith College of Engineering and Computer Science. During the meeting, the group of students outlined the campaign’s goals, specifically that the university stop further fossil fuel investment and eliminate all fossil fuel investments within the next five years, said Ben Keubrich, one of the student representatives. Keubrich, a doctoral candidatein the College of Arts and Sciences, said the administrators were open to continuing discussion about divestment and finding ways to reduce the amount of investments in fossil fuel companies within the university’s endowment. weekend at the Power Up Convergence in Swarthmore, PA, with 200 students from 80 campus across at the country, I know we’re ready to kick it up a notch. At the Power Up convergence, it became clear that we’re flipping the script–our movement isn’t just fighting for divestment, it’s fighting for justice. Registration starts today. Sign up here. Marcellus Spring Break is going to be game changing. We know that if we’re going to win this fight against the fossil fuel industry, we’ve going to have to take it head on — on our campuses, and in our communities. For New Yorkers, that means we’ve got to stand shoulder with the communities fighting the invasion of toxic infrastructure, through direct action and shared strategy. The program will offer top notch organizer training for campus campaigners as well as joint student strategy sessions with frontline and grassroots communities in NY that will sow the seeds of a broad movement to resistance fossil fuels in the spring, summer and fall of 2013. Register for Marcellus Spring Break! Spread the word here and help us grow the movement. Environmental activists often focus on bringing justice to aspects of our world that don’t have a voice, such as air, water or precious animals. But when issue framing does not include humanity, environmental injustices fail to resonate with the general population. This past weekend, four students from the Syracuse University and State University of New York College of Environmental Science and Forestry Fossil Fuel Divestment Campaign traveled to talk about climate change, non-renewable resources and the role of colleges and universities at the Power Up! Fossil Fuel Students Convergence in Swarthmore, Pa.
At this convergence, students from across North America met with their eyes on the prize of divestment, or the act of retracting money from particular investments. In this case, it is to divest college money from the fossil fuel industry, a goal that has swept college students from across the country into action. While many campaigns have focused on climate change’s effects and the economic benefits of divestment, Power Up! was unique. The organizers framed divestment as a social justice issue, which is not unlike the call for divestment in apartheid-ridden South African industries in the 1980s. Thirty years ago, that movement was successful because of effective issue framing and consistent action, and today, South Africa is free of apartheid, due in small part to the college divestment movement. They framed their argument by showing the world what apartheid really meant to South Africans and calling for social justice. With this frame, more people could be reached through empathetic support. Successful framing is a key portion of any campaign. It is a tool to open up the world to the multifaceted sides of an issue while appealing to a larger audience of mixed mindsets. It is not a way to skew issues, but instead reach out to those that think differently from each other. Framing environmental issues in social justice does this by attracting more individuals to work toward the same goal. People are getting sick, literally and metaphorically, of being controlled by the fossil fuel industry, as social injustices range from human health impacts to economic effects. These specific social injustices fall into the category of the overall environmental justice movement – a mixing of the civil rights, environmental and non-toxic movements of the 20th century. Following the Vassar Student Association’s resolution to support divestment from fossil fuels, the Fossil Fuel Divestment Campaign could not be more excited about moving towards positive social change on Vassar’s campus and around the globe. Divestment from fossil fuels promises to bring about a people-powered transition to a sustainable world. Though the atrocities of fossil fuel may seem far from our campus, Vassar’s endowment—like that of so many other institutions—is invested in corporate conglomerates like BP, Exxon, and Halliburton. In order to distance Vassar from oil rigs in the Gulf, mountaintop removal in West Virginia, and hydraulic fracturing in Pennsylvania, Vassar must assume the moral imperative to divest. Divestment is, by nature, a symbolic gesture, a strong statement that Vassar stands against the abuses of the fossil fuel industry: air filled with toxic coal smoke, oil spills on our shores, and catastrophic climate change. Divesting would put Vassar’s money where its heart is and demonstrate a concrete commitment to a healthier planet. Today, oil, coal, and gas companies are among the largest and most powerful corporations on the planet, using their immense resources to mine and drill the earth to extinction. Without divestment, this monolithic fossil fuel apparatus will go on unchallenged and unchanged. Divestment tells the fossil fuel industry that extraction must end. The point of divestment is not to send economic ripples, but political ripples across the spectrum of U.S. society. In acting with hundreds of colleges across the country, Vassar can shift the global political landscape in order to combat climate change and promote sustainable environments, societies, and economies. While opponents of divestment may argue that Vassar’s endowment should not be used to make political statements, we must acknowledge that being invested in certain industries is a political statement in itself. The act of investing in fossil fuel companies is a passive statement of assent to the continuing extraction and use of nonrenewable carbon energy; divestment aims to be an active statement of dissent. In a Feb. 15 interview with The Cornell Daily Sun, President David Skorton called on “students to make their case, [and] put out their points of view” on the question of divesting from the fossil fuel industry. The immediate background to his remarks was the prior week’s passage, by a Student Assembly vote of 22-2, of a resolution to do just that by 2020. In the interview, President Skorton endorsed principles of “socially responsible investing” and reiterated, as an example, his support for Cornell’s 2006 divestment from oil companies operating in Sudan. These positions are altogether to be applauded. He doubted, however, “if we’re going to have broad consensus on [divestment from the fossil fuel industry] on this campus.” This prognosis is in many ways understandable, but will depend, finally, on each of us. It’s in the context of these remarks, and in the hopes of achieving such a consensus, that I want to say what I think the burgeoning national divestment movement is about. Climate change is the transcendent challenge of our time. It is a monster of bewilderingly political, moral, environmental and economic dimensions; so intricate, so immense, so abrupt and inexorable — so scary — are its impacts, it’s very difficult to comprehend. It’s very difficult to know what to do about it. What is clear, though, is that we as a society are not doing enough. Rally for Climate Justice on 2/22 with Barnard Columbia Divest! have been a whirlwind for our movement for climate justice in New York — from the Cuomo administration’s announcement that a fracking decision will be delayed due to the inadequate health review, to more than 1,000 New Yorkers joining the largest climate rally in U.S. history at #ForwardOnClimate in DC. It’s clear that people power works — and that our movement is growing bigger and more beautiful every day. Our friends from Barnard Columbia Divest are bringing the incredible energy from F17 back to their campus for a Week of Action with a teach-in, artmake, and culminating in tomorrow’s Rally for Climate Justice. They’ll be meeting at Broadway and the 116th Street gates at 1:45PM and the march will start at 2:00PM. If you’re in the New York City area, we need you to join Barnard Columbia Divest’s rally to show your solidarity and to show their administration that there’s a serious movement behind this divestment campaign. Not in New York City? Show your support by liking Barnard Columbia Divest on Facebook and following @BCDivest on Twitter! It’s time to draw the line in the sand and stand up to the fossil fuel industry. In what is being called the largest climate change protest in American history, about 50 Ithaca College students rallied alongside thousands of protesters Sunday in Washington, D.C.
About 35,000 people from across the U.S. traveled to D.C. to protest issues that affect the environment, such as the Keystone XL Pipeline, tar sands oil and fracking. The Keystone XL Pipeline is a proposed 1,179-mile pipeline that would transport tar sands oil from Canada to the Gulf of Mexico. Tar sands are deposits of loose sand or partially consolidated sandstone that is saturated with viscous bitumen. Saturday afternoon, six buses left Ithaca for Washington, D.C., two were a combination of Ithaca College, Cornell University and Tompkins Cortland Community College students, one was from Lehman Alternative High School and three were from the Ithaca community. On the student bus Saturday to D.C., sophomore Dennis Fox, a student from Cornell and treasurer of KyotoNOW!, a student climate action organization, explained what students could expect from the protest. 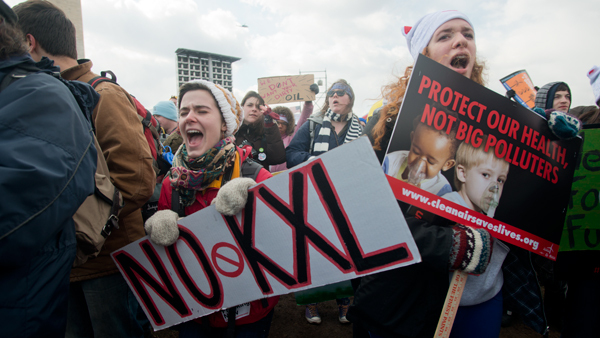 Among the 40,000 people rallying for action on the Keystone XL pipeline this weekend in Washington, D.C. was a group of Columbia and Barnard students who joined the call. Almost 25 students from Columbia and Barnard traveled to Washington on Sunday to attend the rally, which was organized by 350.org, the Sierra Club, and the Hip Hop Caucus to lobby President Barack Obama, CC ’83, to reject the construction of the pipeline. BCD, which wants Columbia to divest its endowments from the fossil fuel industry, did not originally plan to send a group to the rally. But after individual members’ plans generated interest, the group booked a bus with help from the Columbia-Barnard International Socialist Organization on Friday morning, and sold all 55 seats by Saturday night. Once in Washington, Columbia students met activists and divestment chapters from other universities before the rally and march began. 35,000 protestors descended on Washington, D.C. last Sunday, in what’s being called the largest climate demonstration in history. Amid chants of “Shift the power!” and “Keystone pipeline? Shut it down,” protestors, bundled up against the 30° chill, flooded the National Mall in downtown D.C. Waving signs with gloved hands and jostling against each other in astounding multitudes, they called on President Obama to stop the Keystone XL pipeline proposal, and to make good on his campaign promises to take action on climate change. The rally was organized by a coalition of environmental and social justice groups and leaders from 30 different states, including the Sierra Club, Sen. Sheldon Whitehouse (D-R.I.), and the Hip-Hop Caucus, among others. Environmental activist and writer Bill McKibben was also in attendance, marking the latest in a series of many rallies he’s organized for climate action. “For 25 years our government has basically ignored the climate crisis: now people in large numbers are finally demanding they get to work,” McKibben, who visited NYU earlier this month, said. NYU students were among those representing their college fossil fuel divestment campaigns, too. NYU Divest, a movement to persuade the administration to take its stock holdings out of fossil fuel companies within the next five years and reinvest them in environmentally progressive companies, has made huge strides since its inception last fall. The group was one of many student coalitions represented at last weekend’s rally, promoting not only the Divest campaign, but also climate action on the part of policymakers in general. 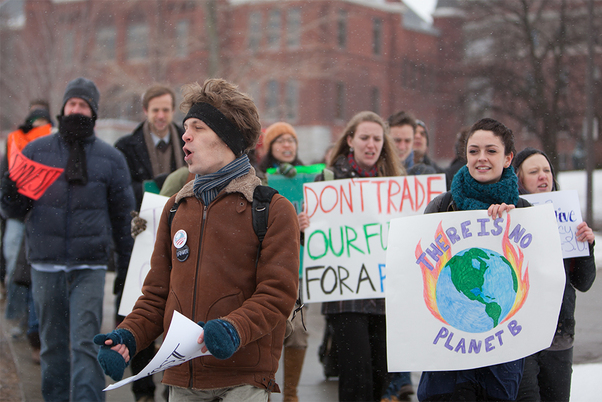 Lindy and other students braved the chill and the crowds on Sunday to call for climate policy reform. Sophie Lasoff, NYU sophomore and Divest campaign coordinator, attended the rally, leading NYU’s contingent. Cornell Students Join Tens of Thousands of Protesters in Environmental Rally in D.C.
Cornell students joined about 35,000 activists from across the country in Washington, D.C., Sunday to protest the Keystone XL Pipeline and persuade President Barack Obama to publicly reject its construction. Nearly 100 Cornell students attended the “Forward on Climate” rally, according to estimates from rally attendees. The Keystone XL is a proposed pipeline system that would run from Alberta, Canada, to the Gulf Coast, transporting a form of crude oil known as oil sands or tar sands. The nature of tar sands makes the pipeline a “global threat,” according to Kelsey Erickson ’13, a member of environmental group Kyoto NOW! who attended the rally. Proponents of the Keystone XL Pipeline say its construction will create 20,000 jobs and benefit the economy, according to CBS News. Though workers have begun constructing the southern segments of the pipeline, for more than a year protesters have maintained efforts to shut down the project. In August 2011, more than 1,200 protesters, including Erickson, were arrested at a sit-in rally against tar sands. Erickson said it was exciting to return to Washington, D.C., with so many people beside her. “How inspiring it was to see how much this movement has grown in such a short span of time,” Erikson said.